LPT: Don't Fill Your Resume with Alternative Facts | Challenger, Gray & Christmas, Inc. This week, NBC News revealed that the business degree listed on a website run by Iowa Senate Republicans and approved by Iowa Senator Mark Chelgren was actually a training certificate from a company that operated a Sizzler franchise. This is a timely lesson for job seekers: lies on a resume may escape notice, but if discovered, can have far-reaching effects. Sen. Chelgren, who once worked for the Sizzler franchise and received the certificate for participating in a training program for operator Forbco Management, stated that he thought the business degree wording was adequate. Since human resource managers and hiring authorities receive hundreds of resumes – some estimates say recruiters review between 500 and 5,000 resumes per month for multiple positions, and spend less than a minute per resume- most misrepresentations will go undiscovered. When resumes are checked, some might be surprised at the amount of misinformation found. While no official statistics exist, some experts estimate that at any given time as many as 10 percent to 30 percent of all job applicants distort the truth or fabricate outright on their resumes. According to 2014 CareerBuilder survey, 57 percent of job seekers embellish skill sets on their resumes, while 55 percent exaggerate duties and responsibilities. Education is a huge problem when it comes to resume fraud as well, with 33 percent of applicants overstating this point. What is most commonly found is the applicant- actually attended the school and may have been very close to graduating but, for whatever reason, did not finish with enough credits for the degree. The person, figuring that missing a handful of class credits is not a big deal, lists the degree on his or her resume. Ironically, the absence of a few credits probably would not make a difference to many companies, but lying on the resume certainly will. The CareerBuilder survey found that 51 percent of employers said they would dismiss a candidate outright if a misrepresentation was found on the applicant’s resume. Even with perceived shortcomings, telling the truth could make for a strong interview. If, for instance, the reason for leaving school early was compelling -- such as ‘a parent passed away and I had to go to work to help support the family’ -- it could be a significant selling point in an interview. Another common lie on resumes is overstating the job title. Job seekers try to increase their earning power by inflating their current or former position and salary, speculating that a prospective employer will not offer less money. Other common resume/interview distortions are "reason for leaving" and "on-the-job accomplishments." These are probably the most difficult areas for employers to check since many companies today will only confirm the most basic information about a person’s work history, such as dates of employment and position held. Additionally, reasons a person left or was discharged and the person’s accomplishments can be complex and abstract. 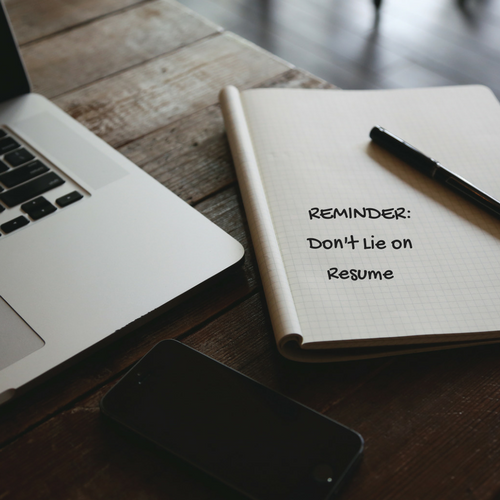 The bottom line is simple: do not lie on your resume. Not only could it cost you an interview, but if you land a position and the fib is discovered, it could cost you the job. Education: Listing degree from a school never attended; inflating grade point average and graduate honors; citing degree from online, non-accredited "education" institution. Job title: Making up a title or boosting actual title by one or more levels in hopes of obtaining better salary offers. Compensation: Inflating current or previous salary and benefits to secure more money from prospective employer. Reason for leaving: Saying it was a mass downsizing when the discharge was based on performance; asked to leave, but saying you quit; underplaying or completely hiding poor relationships with superiors. Accomplishments: Overstating one’s contributions to a team project or company performance; claiming to have received special recognition; exaggerating level of participation in an important aspect of the business.